Costume Showcase is over and it is less than 8 weeks till the course is over for me. It has been a bit of a roller coaster ride and it seems like I only started yesterday. We have 2 shows to complete costumes for in the next few weeks. They are 'The Putnam County Spelling Bee' and 'Love's Labours Lost' then it is all over and we all need to look for work. Although I am learning bobbin lacemaking I keep finding photos of reticella lace which I really like. 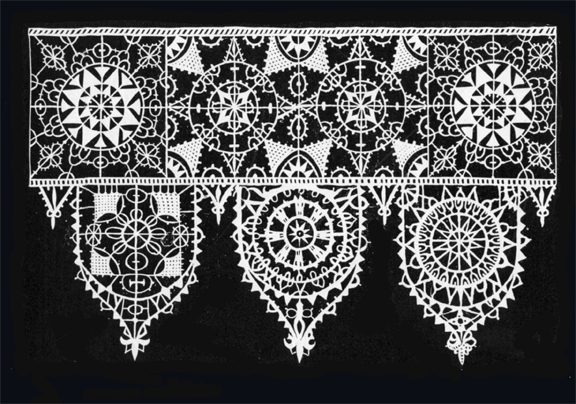 Reticella lace is made by stitching over linen threads. The Duchess of Dunfermline's ruff was probably made this way. In her Ballyhoo Blog, Carlyn Beccia gives a Adobe Illustrator tutorial on ruffs.